Detailed customized reports that can spread knowledge and insight quickly. Develop reports with drag-and-drop simplicity, in a variety of popular formats. 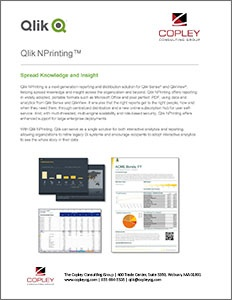 Qlik NPrinting provides the flexibility to deliver reports in a centrally scheduled portal or through a secure, self service portal, while maintaining the security and integrity of data delivered.